"Eloquent and erudite, Robinson's oft-times mystical coming-of-age saga teems with rich and evocative historical insights." "Hypnotic . . . one of the finest novels this year . . . Robinson] is a gifted storyteller." "Makeda is beyond ambitious and imaginative . . . well written and powerful, with an ending that is equal parts tragic and romantic in nature . . . a breathtaking revelation, weighted with romance and lovely passionate prose." "Robinson is not only exploring what it means to be black. His theme of knowing the past before planning the future applies to all cultures, all people. Pick up this odyssey of family drama, history and love, and be prepared to consider your own beginnings." Makeda Gee Florida Harris March is a proud matriarch, the anchor and emotional bellwether who holds together a hard-working African American family living in 1950s Richmond, Virginia. Lost in shadow is Makeda's grandson Gray, who begins escaping into the magical world of Makeda's tiny parlor. Part coming-of-age story, part spiritual journey, and part love story, Makeda is a universal tale of family, heritage, and the ties that bind. 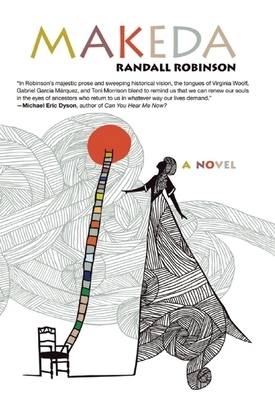 Randall Robinson plumbs the hearts of Makeda and Gray and summons our collective blood memories, taking the reader on an unforgettable journey of the soul that will linger long after the last page has been turned. Randall Robinson is the author of An Unbroken Agony and the national best sellers The Debt, The Reckoning, and Defending the Spirit. He is also founder and past president of TransAfrica, the African-American organization he established to promote enlightened, constructive U.S. policies toward Africa and the Caribbean. In 1984, Robinson established the Free South Africa Movement, which pushed successfully for the imposition of sanctions against apartheid South Africa; and in 1994, his public advocacy, including a 27-day hunger strike, led to the UN multinational operation that restored Haiti's first democratically elected government to power. Mr. Robinson lives with his wife and daughter in St. Kitts.